While staying at the Rifflin'Hitch Lodge in Southern Labrador in Canada, this is the type of Atlantic Salmon you can pull out of White Bear River Falls while fly fishing. A proud man and his beautiful Atlantic Salmon which he pulled out of the White Bear River Falls in Southern Labrador, Canada while fly fishing. This Atlantic Salmon is just a sample of the type of fish that are caught by the guests and fishing guides from the Rifflin'Hitch Lodge. 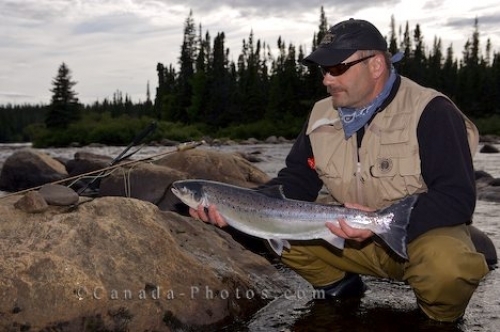 Fisherman with an Atlantic Salmon at White Bear River Falls, Rifflin'Hitch Lodge, Southern Labrador, Labrador, Newfoundland Labrador, Canada. Model Released. Picture of an Atlantic Salmon caught while fly fishing in White Bear River Falls near the Rifflin'Hitch Lodge in Labrador.